Why? Even as I write this this, there are reports that the plan that the House leadership rolled out only this morning is falling apart. It turns out that a number of House members, having shut down the government, need to take something back to their constituents to justify all of the pain and suffering that they have caused the country. And so far what they are seeing just doesn’t seem to be doing the trick. So we have now got a potentially a really big problem here – including for more moderate Republicans. And I am not talking about the slew of recent polling, including an ABC poll released yesterday that showed that 74 percent of Americans disapprove of the way Republicans in Congress are handling the budget crisis, which suggests the Republican Party’s brand is in free-fall as anger grows at the confederate flag waving Tea Party crowd raising hell. (Nor am I referring to the apparent uptick in approval for Obamacare, despite the reported glitches during its roll-out). No, the potential problem is what I know all too well after 21 years working in the Senate. And that is that if one man – perhaps Senator Cruz – wants to gum up the works and filibuster whatever deal is made, it is going to be pretty easy for him to do so. True, Democratic Majority Leader Senator Harry Reid does have some options to limit debate a little, and there are some caveats with any senator-led effort to stall things. For example, if the House does manage to send something over, it will be hugely helpful to Reid because it will take away one of the procedural opportunities that Cruz could use to extend debate. But we are still looking at a matter of days before this can be resolved – and we don’t have that kind of time right now. More from CNN: Is Ted Cruz right? 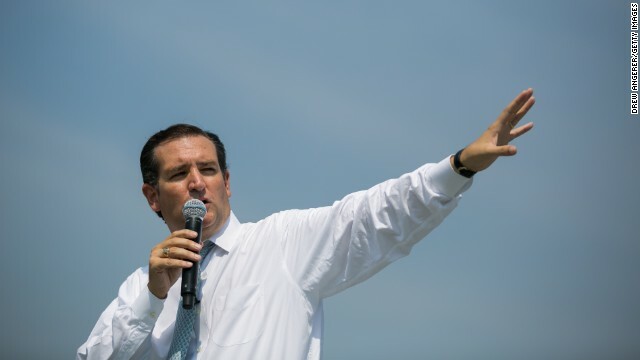 Senator Cruz has not yet indicated whether he will actually go ahead and filibuster. But the question that many have been left wondering is why would he even consider taking the United States over the edge when the devastation is so widely recognized? The answer to that question is that he just doesn’t seem to care about anyone or anything else. He combines the paranoia of notorious Senator Joseph McCarthy and the misguided populism of a politician like Democratic former Louisiana Governor and Senator Huey Long. That explains how he can exploit a World War II memorial by railing against its closure, despite the fact that he himself is responsible for its closure in the first place. Sadly, Senator Cruz is simply one of the most vocal in placing his political whims and survival above the needs of the party – plenty of others have been more worried about protecting their right than doing right. Which is one reason that all the hopeful talk that a deal might be close this morning belies the reality that this might be far from over. « Previous entryWhat next for Al-Shabaab? Debt Ceiling – The buck stops..........where? No new debt limit – no debt ceiling increase - no, USA needs to decrease spending and lower the debt ceiling – for US benefits and for benefits for future generations. What this country needs to do George, is to turn over it's military bases over to it's allies to man and have countries like Australia, India, Iran and South Africa patrol the Indian Ocean rather than us so we can cut the unnecessary military spending. This is the elephant in the room that nobody talks about! Let these countries step up to the plate, so to speak. It looks that you not know what means 'foreign military'?! 'Foreign military' destroys (murders, kills) Americans and Westerners if they are in no alliance. The solution: Australia should join the NATO alliance. Your remark about Joe McCarthy shows very little knowledge of history. Joe was right about Marxist influence on American politics coming out the White House. It was Truman who stopped giving aid to Chang Kai Shek in WW II and gave aid to Mao Tse Tung so the Communist could take over China. Later Truman fired Gen MacArthur who wanted to win in Korea by stopping the Chinese Communists from coming across Yalu river and killing Americans. The Korean war benefited the Communists and left us with an unsolved problem to this day. Your writing does not address the basic problem : why are we in debt and when will it be paid ? Why are we bankrupt from endless wars ? Why do we borrow from Communist Chinese whom we gave our jobs and capital ? Raising the debt ceiling of a drunken sailor while cutting his pay at the same time IS NOT GOING TO DO IT . Next year it will be the same song and dance. What is going on is looting of the American people while you write about personalities in a circus. And you advised whom ? Wrong, rightospeak. Pres. Harry Truman hated the Communists with a deep passion and would have liked nothing better than to give Gen. Douglas MacArthur his way in Korea and let him use nuclear weapons to bomb China into submission just like he did J apan in 1945. However, Truman did fear Sec. General Josef Stalin and that's why he stopped MacArthur. In fact, Harry Truman was once a member of the KKK but quit because it was bad politics. As the saying goes, "Once a Klansman, always a Klansman"! Not wrong ,Joseph, do more reading. Try "The China Story " by Freda Utley starting on p. 30 . Truman may have been under FDR orders. About Korean war see " Freedom Betrayed " by Hoover. Just like today what they appear is not what they are and do. Bertrand Russel said about FDR " he is a Communist and does not even know it ." Quote p. 36 from the" China Story" : "General Marshalll' and President Truman's arms embargo in 1946 was not the first denial of arms to to the anti-Communist forces in China ..... and on and on ... "
It appears that Freda Utley is a right-wing propagandist by writing "The China Story" according to you, rightospeak. True, we did support China during WW2 as an ally against J apan and Gen. George Marshall did the right thing by arranging a truce between the Nationalists and the Communists in Dec.,1946. Unfortunately, Chiang Kai Shek broke it in June, 1947 by going after the Communists only to be beaten and eventually driven from the Chinese mainland. No one in the U.S. government was responsible for any of this. It just happened that way! Utley married a Russian and lived in the "worker's paradise", the Soviet Union. After her husband's incarceration in a GULAG she escaped in 1938 and lived in China. I suggest that you read her book before you spill any more Leftist nonsense , Joseph. If what's taking place in Washington can be likened to war, the question everyone must ask is "What are we fighting for?" I would suggest it goes far beyond Obamacare. And beyond Occupy Wall Street. And beyond most any one thing that anyone might suggest. Yes, there are ample enough problems being deeply rooted and serious enough to jeopardize the way of life as we know it in America. And these problems need to be clearly addressed, prioritized, and dealt with from the proper perspective, starting from the ground up. Let's hope this is what we're fighting for. And if not, make it so. Ted Cruz, one of the hardline conservatives could use Senate rules to stonewall a vote, in attempt to extort a "ransom". The GOP will have to pay for appeasing a small group of Tea Party, that forced the government shutdown in the first place. The Tea Baggers enjoy the international attention they gain by taking centre stage and they abuse their power over Boehner shamelessly. Well said, j. von hettlingen. Unfortunately, as long as people are dumb enough to elect these right-wing fanatics, this country will be in trouble! This is nothing but kicking the can down the road, so that Congress can take their holiday break. Nothing else. The entire battle will have to be fought yet again, in just weeks. Certainly a real possibility, if not a likely outcome indeed. What seems so disheartening about all this, and so many other things, is that it needs to serve as a real wake up call, and cannot just be allowed to be swept under the rug. If anyone thinks it's going to be all sunshine and rainbows and time to celebrate after merely dodging these rather very stupid obstacles, well, you had better think again. There are too many and much bigger problems on the doorstep. Hey maybe this whole debt thing although very real is being stretched out and played out by the government like puppets to be used as and excuse to recall all overseasg forces witout the US lookin like their backing down, I mean all the money theyve spent on weapons and military is whats got em here. SG, Your thinking may not be at all far fetched as some might believe. The consequences of recalling all military presence and involvement in the middle east could leave things wide open to all sorts of repercussions and serious s conflict. One only needs to consider the Israeli and Saudi positions being void of any US military backup or intervention. And more recently it has been noted that Israel is already on edge, and the Saudis are stockpiling weapons. An all out war amongst the many factions in the middle east could readily create an enormous potential demand for weapons which I have no doubt the MIC would be eager to provide giving America some much needed employment and income. But despite any possible benefits, I am no at all in agreement with this unlikely scenario..